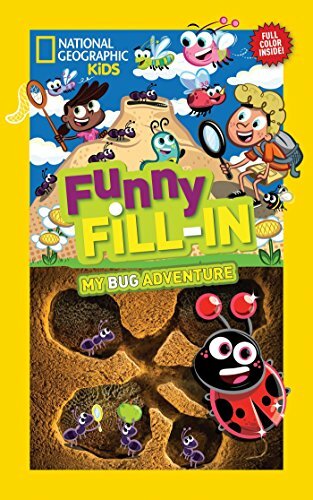 My Bug Adventure is a funny fill-in by National Geographic that is colorful and potentially very silly. Similar to Mad Libs, funny fill-ins can be played alone or with a partner. Using the parts of speech and other terms, children can create wild and funny stories over and over again. What sets this fill-in apart from others is that it is in full color instead of black and white. It also has fun facts about bugs on every page that children will find interesting. Directions are given in the front of the book with break downs of the parts of speech and other terms children will need to know. Children 8–12 years old will enjoy this new type of fill-in activity book. This is a fun activity to also do as a family to create wild and crazy stories while traveling in the car on long trips. Children who love this type of fill-in will also enjoy the dozens of other fill-ins by National Geographic—all with a different theme—that will appeal to the readers and listeners of this series.